Safe Software actively promotes users of FME to become part of the FME Community. 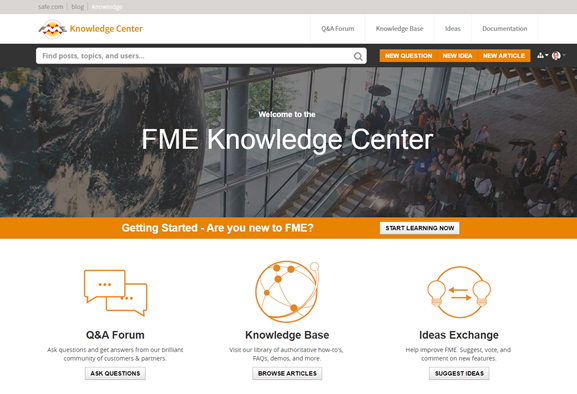 The FME Knowledge Center is our community web site - a one-stop shop for all community resources, plus tools for browsing documentation and downloads. The FME Knowledge Base contains a wealth of information; including tips, tricks, examples, and FAQs. There are sections on both FME Desktop and FME Server, with articles on topics from installation and licensing to the most advanced translation and transformation tasks. FME community members post FME-related messages, ask questions, and share in answering other users’ questions. Members earn "reputation" and "badges" and there is a leaderboard of the top-participating users. Come and see how they can help with your FME projects! FME development is very much user-driven. The Ideas Exchange gives users the chance to post their ideas for new FME functionality, or improvements to existing functionality, and allows everyone to vote on the proposed ideas. The more votes an idea gets, the more likely it is to be implemented! 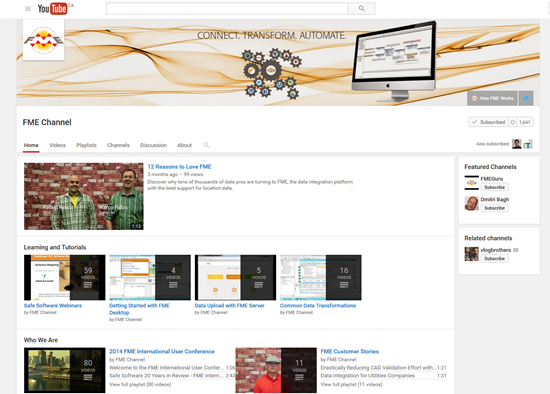 This FME YouTube channel is for those demos that can only be properly appreciated through a screencast or movie. Besides this there are a host of explanatory and helpful movies, including recordings of most training and tutorials.